In our digital times, one of the most well-advised life hacks is organizing all your information in one place. 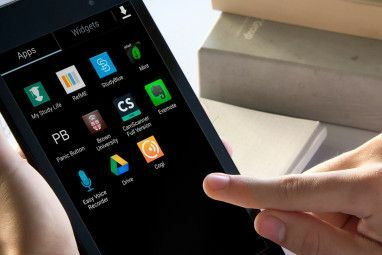 The solution does not lie anymore in labeled ring files, but in their digital siblings – the information organizers that are either software or cloud apps. 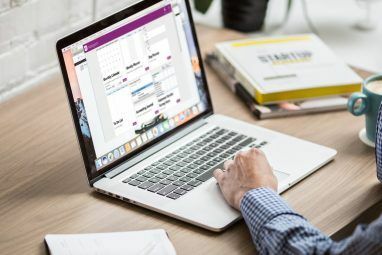 Cloud apps are great for syncing and anytime-anywhere access, but for more hands on control it is difficult to argue with software like the ubiquitous Microsoft OneNote, the ever-popular Evernote, and many others who are trying to carve their own niche. Today, we will be throwing in an easy to use information manager called RightNote into the mix and here’s hoping that you will love the versatility this alternative productivity tool has to offer. RightNote is a digital filing cabinet that allows you to store both large and small amounts of information in a single place, easily tag, categorize and organize that information, and most importantly: find what you’re looking for almost instantly. RightNote (version 2.5.3) is a mere 9.2 MB download and it has a portable version too. 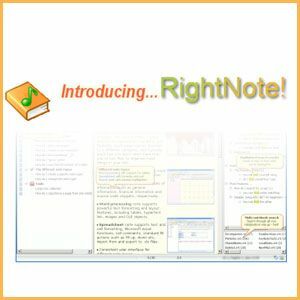 RightNote is supported on Windows 2000/XP/2003/Vista/Win7. The installation happens in the blink of an eye and there are no intermediary nag screens or customization screens for that matter. The main unit of information storage on RightNote is the Notebook. A notebook consists of many Pages and is stored as a single file on your computer. A page on RightNote has a hierarchical Note Tree on the left pane and the content editor taking up remaining part of the screen. All pages are represented as differently colored tabs. The note tree is made up of Nodes (individual notes) hierarchically arranged one on top of the other. The Node is where you add your information and group it in a hierarchy that helps with retrieval. You can have unlimited number of notes grouped together this way. So, the organization of information can be represented as Notebook — Pages — Notes. In my opinion, the ability of RightNote to directly assimilate all kinds of information gives it a flexibility you should pay attention to. The RichView Note type supports advanced text processing, tables, images, objects, and hyperlinks. The Spreadsheet Note type is great for financial data and it can handle the import/export of Microsoft Excel format. The Source Code Note type supports the common programming languages and programmers can use it to store code snippets. The Memo is a simple text note sans the frills of the above three. You can use this for quick-capture of ideas. The Webpage Note can be used to save an entire webpage with all its formatting intact. Attachments and links can be easily added to any note type and linked to external content. The different formats are very usable as you can create your own templates and quickly save information there. A Web Clipper and a screen capture tool give you more options to bring in any information you want to inside RightNote. RightNote handles preserves HTML and Styles so the original look of web pages are retained when you add them with the Clipper. Okay, okay…everyone knows that Evernote has captured our mindspace when it comes to note taking applications and cloud syncing. RightNote bows its head and gives you full Evernote integration. You can store and sync your notes with Evernote and access them from anywhere. Do remember that this feature is available in the Pro version only. If the sum of something great lies in the little parts, then RightNote has quite a few which I am not able to do justice to here. So, I will just skim over the surface and leave you with enough hints to discover them for yourself. RightNote has tags for notes which make them more searchable. The full text search engine is pretty solid too. There are customization options galore which help to tweak the look and feel of the notes (and the program) to your tastes. A full set of keyboard shortcuts and a well-designed beginner’s guide. Then there’s the industry standard 128-bit encryption to help keep selected notes or entire files secure. 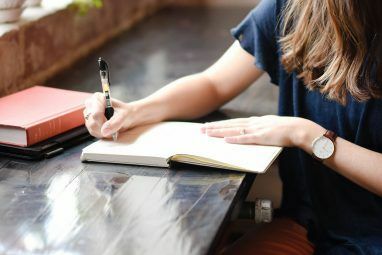 It’s difficult to appreciate a note-taking and information management tool till you get your hands dirty with it. Suffice to say, the RightNote covers all the bases quite well and at least feature wise it definitely holds its own against any of the big guns out there. Old thread, but RightNote is currently (May 28, 2018) on sale for 25% off. It is also up to Ver 4.4.4, with numerous little improvements & new features. As with any application with a broad feature set, best usage is achieved by spending some time with the "Manual" (New User Guide in this case, which is actually contained within its own RightNote database), as well as Actual Usage. Too many "Hightlights" to even attempt to mention, but if you pop for the Pro version you not only get Fully Indexed Searches, but also Multi-Notebook (database) searching - and the option to Export as Webbook allows access on Android devices and Chromebook. I'm experiencing massive problems wih SyncToy: each time I run a 'contribute' or 'synchronize' order, it comes up with an immense list of files it wants to 'rename', because it couldn't identify the latest version. And with 'immense' I mean 150 out of 320! Presently, the only way of preventing the 'rename' procedure, which effectively doubles the files (150 of them, in the above case! ), the only option is to uncheck *each single file by hand*. There is no option to uncheck all 'renames', so please, please prepare a patch to allow this! Until then, I'll have to use some other software: At present, manually copying my files is still faster than employing SyncToy. Nice! Seems to have a few more add-ons that the other organizers DO NOT. It is quite an underrated program. ohh and it seems theres a portable version of this! I will have to check out RightNote. I have been using Onenote because of the Outlook Task integration which is nice but not mandatory. I like the idea of putting one data file in Dropbox which is something I have not done with any of my OneNote notebooks. I have also used Action Outline, TreeNoteDB both nice programs. I'm just trying to keep all my info in one place and keep it searchable without a whole bunch of features being redundant. I heavily rely on Copernic Desktop Search (CDS) so the data files need to be able to be indexed by CDS. Thanks for the referral and nice review, always learn something new and useful here at MUO. Wow. I really need something like this! This would really help me stay organised, especially when I get my Nexus 4 (the device that destroys the iPhone 5 in every way imaginable) I'll for sure buy this through MUO. I've been using Action Outline from Green Parrots for years. Will check it out too. Thanks. Just discovered RightNote about 3 weeks ago, I've been a MyNotesKeeper user for about 2 years. Right now I'm using both side-by-side so I can decide which to stick with long term -- looks like it's gonna be RightNote, especially if I can get enough points! Start accumulating the points. If not this, you can have them stacked up for the next Rewards we announce :). Even otherwise, the free version itself is pretty good. This is a confusing product category to navigate as a consumer. There are so many products that skin the notation / doc storage / collaboration cat in so many different ways. I use Notational Velocity for the Mac, and find it to be incredibly useful and efficient. But it has limitations with storing associated files, the text editor is less robust (something I actually prefer) - and it's just different. I feel like every six months I'm changing my approaches to productivity management. Good to learn about this one. The Source Code Note looks handy, Evernote doesn't have that feature. I wish they offer syncing with other service, like SimpleNote. it looks good, and also has nice features. You forgot to mention that it comes as freeware, standard and professional versions. I don't know about this one. I think I'll play with OneNote a bit more. I've been using it for sdome time now and it works fine. The integrationwith evernote is nice. Now I see RightNote as a spohisticated client for evernote, witch is awesome. GREAT TOOL! Wordt the 500 points. It really to have user feedback like this, as RightNote is not that well known in comparison to its famous cousins! Just started using the freeware version but based on this review (which is excellent BTW), I think I will use my points to get this pro version for the added benefits. I love this program, I use it for my Marketing / Social Media class in college. It's a powerful, and elaborate note taker, and I can just save the note file in my dropbox so it syncs everywhere, plus getting it for free through MUO is nice too :). Yes, Evernote is more famous, and so is MS OneNote. But feature for feature, this can easily hold its own and even surpass Evernote in some respects. Before RightNote I used Evernote, this has way more option and features though. Also MakeUseOf (MUO) is giving away licenses for 500 points, like they mentioned at the end of the article.